In first two films it's blue originally. It's green in jedi only (when Luke makes his own). For example; when Luke uses his fathers saber against the flying "training probe" inside the Falcon on their way to Alderaan, it was blue. Lucas changed it to green in later versions sadly. He sure didn't make that change. It turned cyan after they were changing overall tone. In the same manner, Vader's sabre turned a bit pinkish. Those were not any kind of intentional changes, they were just lazy and not make the corrections. Still, should'nt despecialized version have the blue saber? I remember that the original had it. Make sure what you downloaded was the actual Despecialized Edition. There seems to be a lot of re-encodes and just mislabeled crap out there. 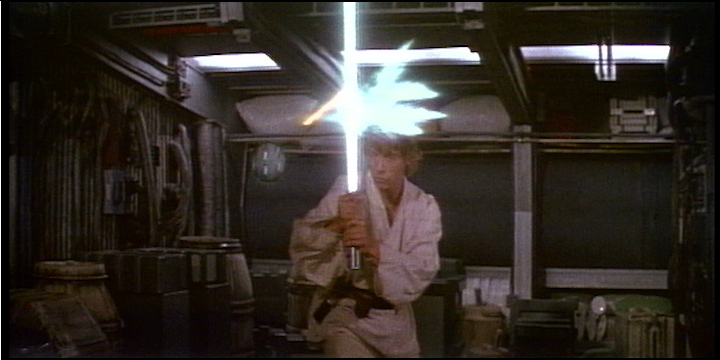 I always prefered Luke using a white lightsaber in the training scene on the Millenium Falcon, like it has been in many of the home releases. I imagine it to be a training mode with a less intense nonlethal blade for the lightsaber so he doesn't kill himself if he swings it around and cuts himself by mistake, though its strong enough to reflect those very weak blaster bolts being shot by the droid. Using his father's lightsaber in full blue killing mode when he's at the very beginning of his training seems very foolish to me. It also seems kinda disrespectful to his father's lightsaber and doesn't fit in with the beliefs of the Jedi, the Jedi like Samurai seem to hold their lightsabers in high regard, they even have to build their own themselves as part of their trials, like learning samurai would use wooden sticks to train, i'd imagine jedi apprentices would use weaker nondeadly lightsabers to train rather than fully fledged lightsabers so they could spar without killing each other. Good change by GL as far as i'm concerned. Makes much more sense and fits better with the mythology IMHO. The white blade was a consequence of contrast/gamma boosting on the video transfers. From what I've seen of theatrical prints, it was light blue in every shot. I assume the greenish white in the 97SE recomposites was either due to the color correction being botched, or possibly the glow elements having faded and not being able to be fully corrected back to the original color. The 04SE green blade was just a complete and inexplicable screwup. That scene could have been "corrected" in the same way as the duel in 2004, but for some reason it was never done. Even in 2011, all they did was fix the green saber. 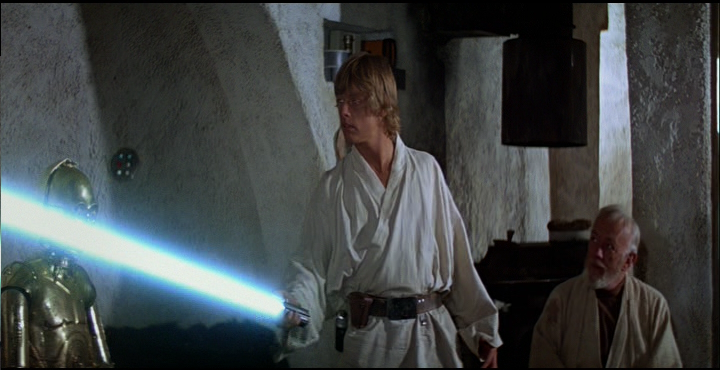 I've done a lot of colour grading and i'm pretty certain boosting the contrast and/or gamma was not what turned that blue lightsaber white, especially not that very strong blue of Luke's lightsaber during the training scene visible in those technicolor frames available on ebay. No, I think it was changed to white from the theatrical release where it was a very strong blue for a very concrete reason by GL and for all the reasons I stated above I agree with him and consider it an improvement. The greenish colour in some of the shots is clearly an SE cockup but one that is easily fixed, like I have done in the Star Wars Semi-Specialised Edition V2.2, where the lightsaber stays white throughout that training scene on the Millenium Falcon. Your typical home video boosting, in combination with the rapid-fading filmstock that was used, pretty much gets you a white blade. An intentional change would not have been necessary, even if he'd wanted to make it. What Technicolor frames on eBay? I'd like to see these. If that was the case, why didn't Obi Wan's blue lightsaber also turn totally white in those home releases? No, I don't buy that, I see intent in that change, but I don't think we're going to agree here so we'll just have to agree to disagree. You can find more by looking at the current listings and completed listings of the seller, all the frames are being sold by the same guy. The scans seem to be decent-quality--not the best scans out there, but maybe the only publically-viewable ones of some of these shots. 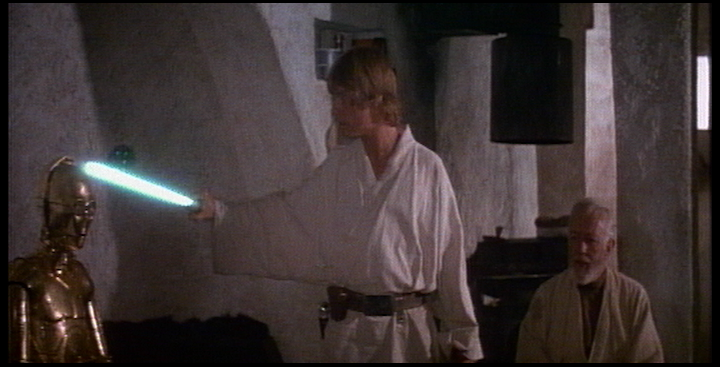 The blue glow was not as thick on the Luke training scenes to begin with. If you look at those Technicolor frames, you'll notice that it definitely has more white core and less blue glow in that scene, vs. the other scenes with the lightsaber. Boosting could well have diminished the blue in that one scene only. We discussed this at lenght in http://originaltrilogy.com/forum/topic.cfm/Complete-Comparison-of-Special-Edition-Visual-Changes/topic/11927/page/12/ a few years ago. To be honest I'm still not sure what the hell they did back then, the compositing is so technically inept in the Special Edition I can't really tell if they used original elements or just re-rotoscoped them from scratch. (it clearly was the ILM B-team handling it) The reason I find it hard to tell is that all the quirks and shortcomings of the original compositing are still there but with new ones added on top. Apparently it was so poorly redone that most people, who don't remember or are newcoming fans, still to this day think they're seeing the original lightsabers when they're watching the SE of the first film. Also, the only lightsaber shots that were remade for the 1997 SE was the one in Ben's hut and those aboard the falcon and they were far from an improvement. They eliminated the dupe grain and that was all. The cantina saber and the duel was remade in the DVD version in 2004 with Ben suddenly wielding a Mace Windu saber in certain shots. Just a few examples, one is a faded original, the other a "state of the art". ^ Instead of repositioning the original crude animation (it's clear it was meant to be positioned where the laser hit the blade) the animators decides to repaint the original effect - paint where there before was ship interior. I guess it's possible the crude animations seen aboard the falcon are separate elements and that they were done by that ILM guy who did the laser bolts, I don't recall his name at the moment (ashamed) but I doubt it. AR: Nelson, it's not just cartoons is it? Apparently you also came up with the idea of the light saber for Star Wars? Exactly how? NS: At that time, I was working for a company in the States, and my manager called me in one day asking if I could work on the effects of the live action for the film. So what we did was they brought in the Star Wars clip causing effects, and asked me if I could draw the light saber with the animation. I first got to learn about a device called the rotoscope, in which you put the film in the camera, shed the light on it, and then it shows on the animation table. Then, you trace the live action drawing parts. People from Lucas Film came to pick it up. 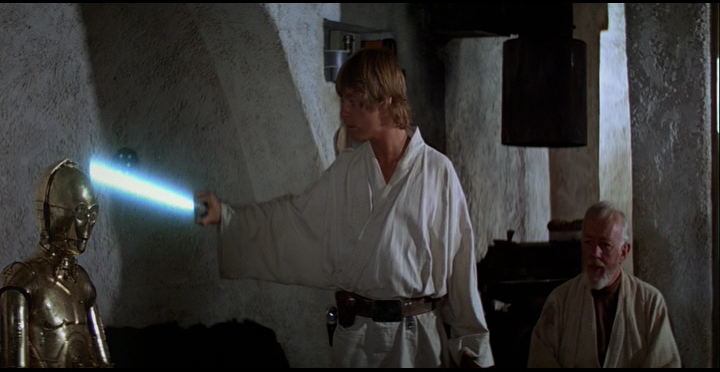 I explained to them since the light saber is light, and the light should look a little shaky like fluorescent tube. I suggested that when printing with optical printer, one frame should be inserted so that one could be printed much lighter than the other. By that way, it would look like a fluorescent tube or laser. I also asked them to pass on the information that when adding the sound, a degauser, which is used in deleting tapes, should be placed on the top. Then, this device would make sound, because it has magnetic field like light streaming. So that's how the light saber came to life. In fact, I did not need one month, but finished it in a week. My company was very surprised because I finished it within one week. When people from the Lucas Films picked it up, they put me into the director's chair. They showed the product from behind with over the shoulder on the small screen, and it was excellent. I did not expect such effects at all. The team had followed my advice on adding sound, and on using an exacto knife to cut the paper to give a very sharp look of light. They asked my opinion about it. Since my vocabulary was not good at that time, I said, oh, it's ok. I should have said, oh, it was really great. They said it was more than ok. At that moment, I felt that I should learn how to express my feeling with more excitement. Lucas film sent some people 3-4 times to scout me with generous offers. But at that time because Star Wars was just released and I didn't realize it would expand into a very long series. I refused their offers because I was not sure about moving into a new field. I'm sorry Nelson, a couple of computer nerds up in Marin County have since replaced your work. Also I have read elsewhere that Barry Nolan at Van der Veer Photo Effects did the glows. But maybe that was only some scenes? I forget, was that glow on the ceiling beam in the original shot there on the whole shot, or was it an "environmental" glow that was double exposed in only during that impact animation? Interesting. They are credited all right. It sure makes sense that there was several guys being responsible for the lighsaber effects in the original film when some of those effects looking quite different from each other. No idea what their work encompasses. Maybe time to take a look in Rinzler's making of again. Adam Beckett was the guy who did all the laser bolts in the film, he also did the animation work on Artoo when he's captured by the Jawas but he was an in-house special effects guy. The ceiling beam only got "painted" in the Special Edition redo, and only during two impact animations IIRC. Are you suggesting the shots were optically recomposited instead of digitally? Sorry, not sure if I understood your question. Oh, I was wondering if the original shot had some secondary animated light reflection off the ceiling beam that was incorrectly interpreted by the SE crew and redone as part of the actual impact. I just realized, no, they did misinterpret a light reflection in the live action as part of the animation. It makes no sense, you can clearly see it's still there before and after the impact animation. And I think some of the lasers were also done by Peter Kuran, who would later form his own company, which was given a lot of the lightsaber animation work in Jedi. I have a Cinefantastique issue with an interview of him, let me check that sometime. Yes, originally it was going to be restoration of the original film. But while they were in there, they decided to add the Jabba scene and maybe redo a couple of the Battle of Yavin shots. Then it went on, and on. They started Star Wars in 1993/4, then decided they should do the other two in 96 I believe. Eventually I'll write an article on the history of the SE, but I'm not sure how to go about it. It would have been a really nice, cleaned up shot without the dinosaur. Some of the work those other companies did could have been wipes/dissolves. Yeah, Peter Kuran was one of the animators working under Adam Beckett. Beckett was essentially the one responsible for the work but he had of course a team of animators under him. Anyway, I found an old interview where Beckett mention Barry Nolan at Van der Veer Photo Effects being responsible for the lightsaber effects just like you said. So that's at least two companies responsible for the optical lightsaber work on the first film. Haven't checked what work Ray Mercer & Company, Modern Film Effects and Master Film Effects did on the film. It's likely they did wipes and dissolves like you say. Mercer, Van Der Veer and Modern effects all did work on ESB too. 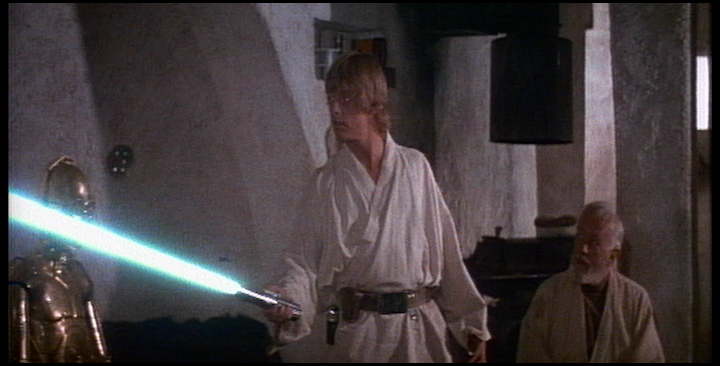 Luke's lightsaber in SW also looks cyan in the shot where it's first ignited instead of the more familiar azure of Ben's lightsaber and Luke's saber later on in TESB. 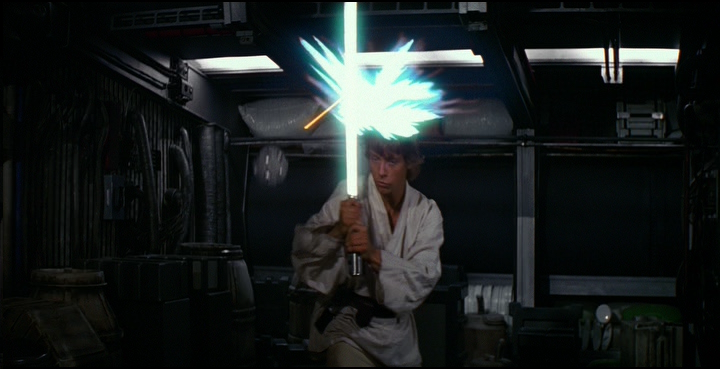 Yeah, Luke's saber does seem to have been intended to be cyan through the whole film. It's just that in that scene the color transferred over to video and in most of the training scene it didn't.